Do you want an active pregnancy? We all know that exercising during pregnancy can improve your mental health and also prepares you for childbirth by strengthening muscles and building endurance. The most important thing an expectant mother keeps in mind is that both she, and baby are healthy and safe. You may be a seasoned athlete or couch potato, either way, it is always best to discuss with a healthcare provider before starting, continuing, or changing an exercise routine when you find our you are pregnant. Thanks to Placenta Previa I am really limited in what activities I can do which has left me feeling pretty glum. However that said, don’t let the feeling that you need to be so fit that you can run the twenty four miles to the delivery suite put you off. Exercise during pregnancy should be all about what is achievable for you. Swimming, walking or yoga are all light activities that are popular options in pregnancy. Check out our top tips for safe exercise for expectant mums. Relaxin overproduction means ligaments are even more vulnerable to painful pulls. Many gyms and community centres offer fitness classes designed specifically for pregnant women and have instructors who can offer expert guidance on exercising safely. After 20 weeks do not lie flat your back. The weight of your uterus can put pressure on your body which can make you dizzy, short of breath, or nauseated. Often the last thing you want to do is go to the toilet more than you already are, but drinking enough water is essential as dehydration can also increase your risk of overheating or even trigger contractions. In the second and third trimesters baby pushes up and the expanding uterus puts pressure on the lungs which can lead to breathlessness. Your increased heartrate to ensure baby gets enough oxygen means you can also tire easier. Choose a functional, stylish maternity active wear. Are you finding that normal sportswear digs into bump and the tops have not enough to fit around you? Or that some maternity active wear is so loose fitting and baggy it makes you feel like you are drowning in fabric? 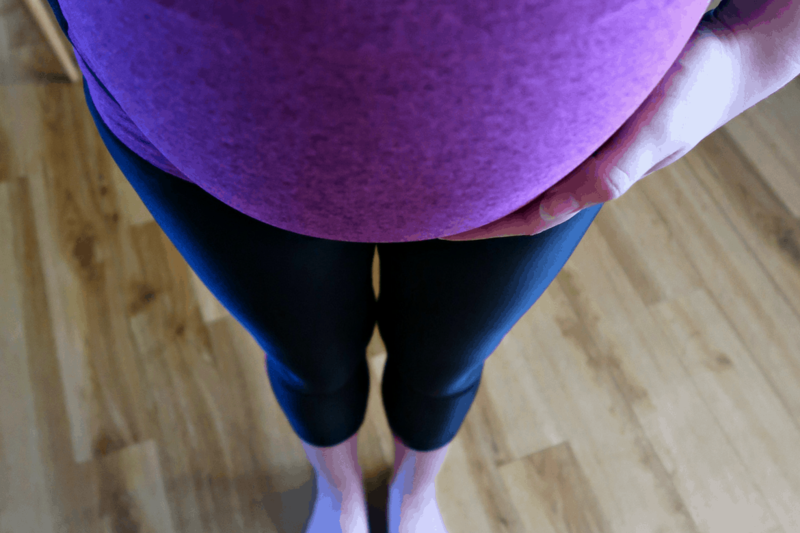 Speedbump maternity clothes are produced in the Uk and I love their leggings as I have found my growing bump to be uncomfortable and often wear a bump band. The thick double layer waistband offers more support than a lot of my everyday maternity clothes and they stretch with your body so I can see me happily wearing them post birth. The sculpting fabric means it doesn’t slip or roll down when you move. As you sweat at a lower temperature when pregnant it is extra important that the material is lightweight and keeps you cool. The leggings provide me with enough warmth to face the chilly November mornings and the mesh panels mean my skin can still breathe. The maternity T shirt, different from my usual favoured razor back (which Speedbump also make) is a favourite pick as I could wear a maternity bra underneath and not worry about the extra thick straps showing. The material is super soft, comfortable and not scratchy, perfect for that extra sensitive pregnancy skin. It is cut longer at the front so maintains a good fit during the whole nine months. Selling in pink blue and granite I love the different options and that the site offers free shipping and free returns. We would definitely recommend buying a set, I think these will stay my activewear of choice even after baby is born. Note: This is a collaborative post, we were kindly gifted the outfit for the purpose of this review. All views and opinions are our own.